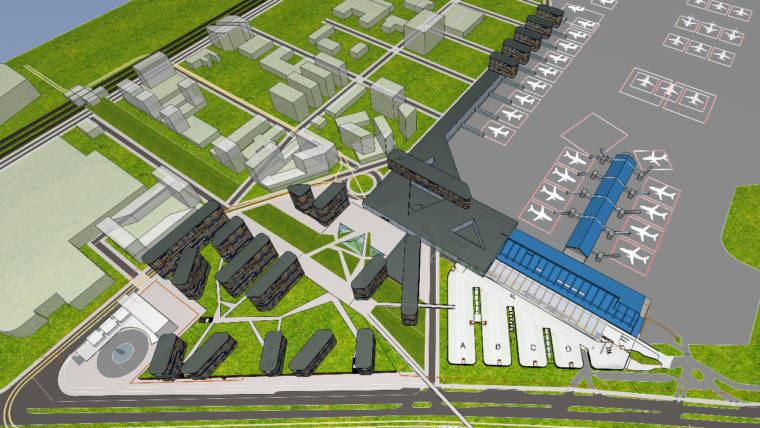 The vision of Tallinn Airport by year 2035 includes expansion of the passenger terminal for serving up to 6 million passengers, and construction of the airport city. The long-term development vision of Tallinn Airport gives a direction to the future development of the whole Ülemiste district. The need for expansion is based on constant increase in the number of passengers. The current passenger terminal has been built for 2.6 million passengers, and already last year we crossed the line of 3 million passengers. In the past five years, the number of air passengers has increased by 50%, i.e. by one million people. “If we want to maintain our status as the best airport in Europe, in addition to all other conveniences and services we also have to ensure good throughput of passengers, thus ensuring timely departure of flights” said Piret Mürk-Dubout, chairman of the board of Tallinn Airport. An increased number of passengers also directly influences the economy. “3 million passengers influence the economy about 2.6% of the GDP per year. It means that the whole Estonian economy gains from the increase in the number of passengers,” said Anneli Turkin, member of the board of Tallinn Airport. In 2035, the expanded passenger terminal of Tallinn Airport will be able to serve 6 to 8 million passengers per year. The terminal area is nearly three times larger, reaching to 85,000 square meters instead of the current 34,000 square meters. The number of passenger gates will increase by half – from thirteen to twenty six. “We will begin with the design and expansion of the most critical facilities already this year – including the expansion of border control, baggage handling and additional waiting areas. We will also expand the pre-flight security area and work with the Police and Border Guard Board in order to implement automatic border control,” added Einari Bambus, member of the board of Tallinn Airport. By 2035, up to 150,000 square meters of business, service and accommodation premises are planned to be built into the airport campus, mainly for serving air passengers. The whole campus will be an important asset for Tallinn and the whole Estonia, facilitating business and conference tourism and making it possible to earn additional income. The construction work is planned in stages, according to the possibilities of the business environment and based on the estimated number of passengers. Visual plans: author Meelis Press.